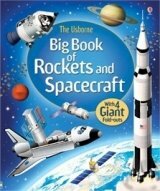 Open the giant fold-out pages of this book to discover the powerful rockets and spacecraft that explore outer space. From early rockets and Moon missions to space stations and probes, learn what it takes to blast off from Earth and even live in space. The oversized pages show magnificent spacecraft and rockets to scale, up-close and in detail.